This portraits of J. L. Toole was on many advertising materials like leaflets and posters. 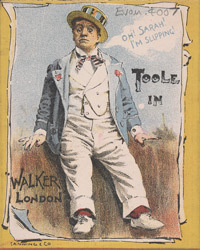 J. L. Toole was a famous comedian and actor and performed on stage for over 40 years. He was immensely popular, both with his audiences and his contemporaries and was also a good businessman. He took over the ‘Folly Theatre’ and renamed it ‘Toole’s’, staging several successful plays. He died in 1906 leaving a considerable fortune out of which he made several considerable bequests to charity and theatre.